SAPscript is the integrated text management system of the SAP R/3 System. SAPscript is tightly integrated into the SAP System. It is used for many different word-processing tasks all over the SAP System. T/code - SE71 - Menu Path - Utilities > Copy from client. Provide the name of the Layout set which you want to copy and enter the Target Layout set [ The layout set of yours should always start with Z ] & Execute. Enter the name of the target layout set to be created. Press Create. Enter the description of the layout set, which is required. Use Menu Path - Layout Set > Copy from. A pop up window appears. Enter the source layout set name and the language required. Press Enter. The source layout set is copied to the target. Now one can modify the layout set as required. The modified layout set can be used with the corresponding program as required. In order to create layout sets, use the T/Code - SE71. 1) Enter the layout set name to be created [ start the layout set name with Z always ]. Press Create. 2) Enter the description of the layout set. 4) Press the Pages available on the Application toolbar. 5) Enter the Page name and press Enter. Enter the description now. The page entered now appears on the display above. 6) Press the Windows available on the Application toolbar. 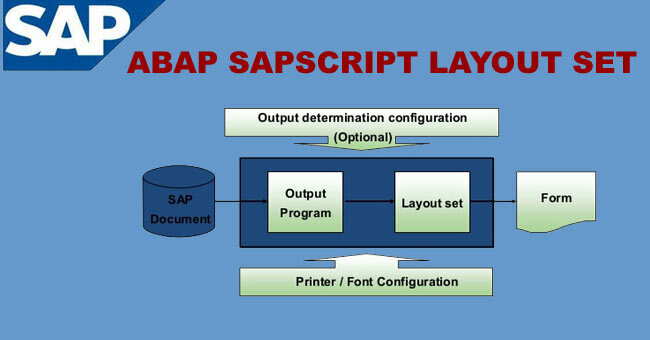 By default, SAP provides you with the MAIN WINDOW for a layout set. This appears in the top display area. 7) In order to create new windows, use the menu path - Edit > Create element. n the popup window, enter the name of the new window along with a description. One can change the window type, if required to Constant / Variable. Create as many windows as required. 8) Press Page Windows. Use the menu path - Edit > Create element. A popup appears listing the windows created earlier as in Step 7. Choose the window to be inserted on the page and press Enter. Change the margins [ left & upper ] and the window width & height. Repeat the same in order to insert more windows on the page. Note: The upper margin of the following window is calculated based on the upper margin and height of the previous window. 9) Press Paragraphs. Use the menu path - Edit > Create element. A popup appears in which you enter the paragraph name and description. Press Enter. The paragraph is used to control the display of text elements on the page [ left, right, center, block justified ]. Change the Alignment of the paragraph as required. If required, the font used in the paragraph [ set as default ] can be changed using the Font. Create more paragraphs as required. 10) Goto Page Windows screen. Choose one of the page windows where the text element has to be entered. Press Text Elements. The text editor appears where the text can be entered. Choose the paragraph required via F4 key at the leftmost part [Tag column] of the screen. The paragraphs created earlier in Step 9 appear in this list. Enter the required text. Display of text on subsequent lines can be changed by varying the format in the tag column. 11) To include texts like date, page number, etc., use the menu path - Include > Symbols > System. A popup appears listing the system symbols available. Choose the required symbol and enter Continue on the next popup. This inserts the symbol on the text element. 12) Having created the layout set, goto the Header and enter the Default Paragraph and the First Page. Use the menu path - Layout Set > Activate. Any errors in the layout set will appear in the status bar. Correct the errors, if any. Activate again. Save the layout set at this stage. 13) Use the menu path - Utilities > Test Print. A popup of the print parameters appears. Select the printer and do a Print Preview, where the layout set can be viewed. Note: Use T/Code SPAD [Spool Administration - Page Formats] to view the default settings of various page formats available in SAP.